Using side rails is an ideal way of protecting clients from falls and minimising the risk of injury, especially during unsupervised times. However, side rails can introduce their own problems, as patients can become injured from impact with the rails or if their limbs become entrapped. The Invacare Line Side Rail Cover is an ideal option, protecting the user from the side rails and enhancing the overall safety of the bed. 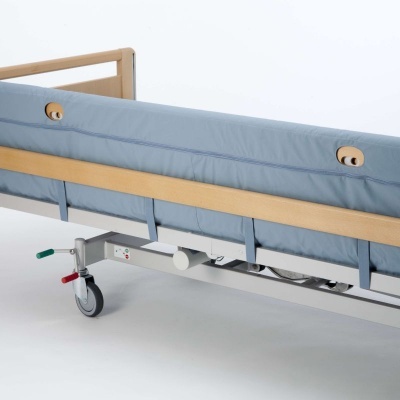 This padded cover provides a barrier for the patient, stopping them from coming into direct contact with the wood railings. Using a cover can protect against bruises and minor injuries for vulnerable patients. The cover can also help to prevent a patient's limbs from becoming entrapped within the rails, which is a common cause of injury. Please note: This product is supplied as a single cover, suitable for only one side rail.